The Response Hierarchy Models explains the consumer responses and behaviour to the advertising process. The Models provide a complete understanding of the responses of a customer through all stages of his path from unaware of the product to the purchase action. The phrase AIDA stands for Attention, Interest, Desire, and Action. The AIDA model is used in advertising to define the stages that exist from the time when the consumer first becomes aware of the product or the brand to when the consumer purchases a product. The AIDA model is one of the most established models amongst all the Response Hierarchy Models. The organisations employ the AIDA Model to obtain the necessary response from the targeted consumers through advertisements. This model can be operated successfully to stimulate the different emotions of the customers. This is the awareness stage of the model where the consumer becomes aware of a brand or a product mostly through advertisements. This is the stage when the consumer shows some interest in the product after understanding its benefits and learns how well the product actually fits into his lifestyle. This is the third stage of the AIDA model when the consumer desires to own the product. He develops a favourable disposition towards the product. This is the final step of the model where the consumer finally takes favorable to satiate his desire. In this stage, he takes a purchase decision and buys the product that is being advertised. In the AIDA model, the awareness of a brand or a product takes place in the Cognitive stage, the potential consumers develop an interest and desire to purchase the product in the Affective stage, and the purchase action actually materializes in the last stage called the Behavior stage. Hierarchy of effects model was designed by Robert J Lavidge and Gary A Steiner in 1961. This advertising communication model describes that there are 6 phases from the phase where the customer views the product to the purchase phase. The job of an advertisement is to prompt the customer to endure all the six stages of the Hierarchy-of-Effects Model, namely the Awareness, Knowledge, Liking, Preference, Conviction, and Purchase. This is the elementary stage of the model when the customer becomes aware of the product or a brand. This is a very crucial step, as there is no surety about the customer’s viewership or the awareness of the product. Consumers may view various advertisements, but the chance of a customer registering the advertisement in his mind depends upon the intensity and the impact your advertisement made on the target consumers. The customer starts collecting the required information about the product in this phase. He slowly tries to understand the benefits associated with the product through the internet, retail advisors or through people who have already used the product. Consumers may easily switch to the competitors brand when they are unable to collect the required information. Therefore, it is the responsibility of the advertiser to make sure that the product information is easily available. This is a stage when the customer develops a liking for the product. Here the advertiser’s responsibility is to highlight the product features to further promote the brand or a product. This is the fourth phase of the Hierarchy-of-Effects Model. During this phase, the customer is clear about the product qualifications and he is sure about his brand choices. Here the advertisers need to constantly reinforce the positive aspects of their brand. In this stage, the customer would have made up his mind to buy the product. The advertiser’s responsibility here is to guide the customers to choose their brand. This is the last stage of the hierarchy of effects model in which the actual purchase of the product takes place. In the Hierarchy-of-Effects model, the awareness and the knowledge phases fall under the Cognitive stage. 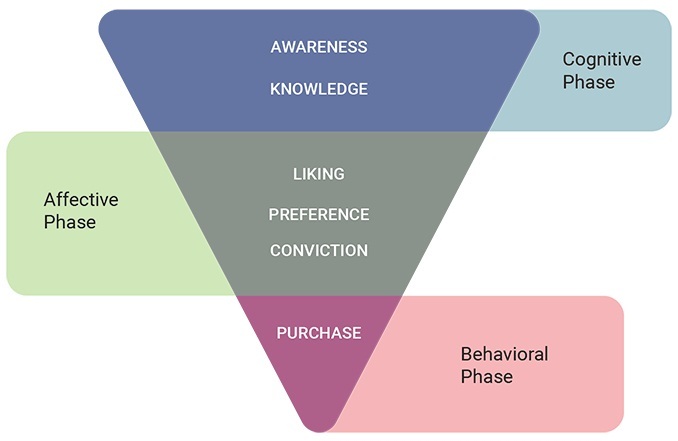 Evaluation of the customer liking, preference, and conviction fall under the Affective stage and the actual purchase behaviour takes place in the Behavioral stage. Innovation-Adoption Model was developed by Rogers in 1995. He postulated various stages in which a target customer sails through from the stage of incognizance to purchase. The 5 stages of the Innovation-Adoption Model are Awareness, Interest, Evaluation, Trial, and Adoption. This is the primary stage of Innovation-Adoption Model. takes action is the awareness stage of the model where the consumer becomes aware of a brand or a product mostly through advertisements. This is the second phase of the Innovation-Adoption Model. This is a stage in which the information about the brand or a product multiplies in the market and triggers the interest of the potential buyers of the product to gain more knowledge and information about the product. Evaluation is the third stage of the Innovation-Adoption Model that supplements the necessary information regarding the product to the consumers. In this stage, the consumers evaluate and try to gain a deeper understanding of the product that stimulated interest in them. In this stage, the customers try the product before making the final choice to purchase the product. Adoption is the final stage of the Innovation-Evaluation Model. In this stage, the customer accepts the product, makes a purchase decision and finally purchases the product. In the Innovation-Evaluation Model, the Awareness happens at the Cognitive Stage, developing an interest and evaluation phases fall under the conviction phase, and the trial of the product and the actual adoption fall in the Behavioral phase. The Information-Processing Model is a structure used by cognitive psychologists to define the mental processes. This model links the human thought process to the computer functions. It signifies that the human mind, like the computer takes in information, organizes, and stores the information to be repossessed later. It claims that just like the computer possesses an input device, a processing unit, a storage unit, and an output device, the human mind also has a parallel framework. The Information-Processing Model comprises of 6 stages namely the Presentation, Attention, Comprehension, Yielding, Retention and the Behavioral stage. The presentation is the fundamental stage in the Information-Processing Model. This is the awareness phase where the consumer becomes aware of his needs and seeks a product to satiate his needs. This is the second stage of the Information-Processing Model, where the product seizes the attention of the potential customers. In this stage of the Information-Processing Model, the consumer compares and evaluates various products of different brands accessible in the market to ascertain the product that actually meets his requirement. This is a stage in which the customer figures out what exactly he wants and the brand and its product that balances his needs to its specifications. This is the fifth stage in the Information-Processing Model. This is the stage in which the customer remembers the key features and attributes, the benefits and all the positive aspects of the products that he is seeking to purchase. This is the last stage of the Information-Processing Model in which the purchase action of a product of a particular band takes place. In the Information-Processing Model, the Presentation, Attention and Comprehension take place in the Cognitive stage, Yielding and Retention of information fall under the Affective stage, and the final Behavioral action takes place in the Behavioral stage. Operational Model is a strategic framework that works by three activities namely the Non-Evaluative Thinking, Evaluative Thinking, and Action. This is the first stage of the Operational Model. In this stage, the consumers are exposed to the different brands and the multiple products that they offer. This is the awareness stage which creates awareness among the potential consumers. Evaluative thinking is the second stage of the operational model. This is an evaluation phase wherein the potential customers evaluate different products and juggle the same with similar products of various brands to make that one choice amongst the various alternatives available. The action is the last stage in the Operational Model. This is a stage wherein a consumer makes the final purchase decision and purchases the product. In the Operational Model, Non-Evaluative thinking takes place in the Cognitive Stage, Evaluative Thinking falls under the Affective Stage, and the Action falls under the Behavioral Stage. Nonetheless, we can conclude that irrespective of the type, character or the description of the models, the first stage of all of the above models is the awareness phase, followed by comprehension. Unless awareness is created and comprehension is developed, the message cannot be reinforced. Thorough understanding of these effects in relation to developing a strategic framework is crucial!